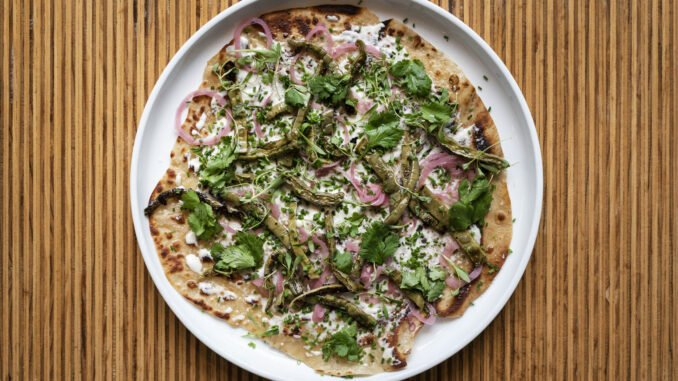 Today, acclaimed chef Akhtar Nawab of Brooklyn’s Alta Calidad debuts Otra Vez in New Orleans’ emerging South Market District. His first project in the Crescent City, Otra Vez merges the layered, complex cooking of Mexico and the Indian food Nawab grew up eating with the diverse cuisines and ingredients represented in New Orleans. At Otra Vez, Nawab’s refined style of cooking is rooted in the big, classic flavors of Mexican cuisine and the myriad ingredients and Gulf seafood of Louisiana. The dinner menu, which will soon expand to lunch and brunch, begins with starters such as guacamole with guajillo salsa and chilaquiles with shrimp, fideos and tomatillo salsa, followed by a rotating selection of tacos on house-made tortillas and small plates like pumpkin blossom quesadillas and Mexican roti, a play on Indian flatbread. Larger plates such as Mexican-spiced blackened whole fish, vegetable sides and Mexican-inspired desserts round out the menu. The beverage program pairs seasonal fresh juices with nearly 150 varieties of tequila and mezcal. Located just off the dining room, a street-facing taco bar and window dubbed ACTQ offers tacos and tequila cocktails to-go, late into the night. The design at Otra Vez, led by the husband and wife team at Farouki Farouki, ties together diverse influences and styles, mirroring Nawab’s menu. Inspiration for the interior leans towards coastal Mexico, with light woods, geometric patterns, bright details and natural materials decorating the space. The 48-seat dining room is adjacent to an 18-seat bar and larger communal chef tables seating another 18 guests. The sun-dappled restaurant is thoughtfully adorned with Mexican street art, succulents and ubiquitous Mexican ingredients like limes, tomatillos and avocados inspiring pops of fresh and playful color.